Five UNB engineering students are redesigning an essential piece of transportation infrastructure in downtown Sussex. A plan for the Trout Creek Bridge, built in 1935 and which has far exceeded its expected service life, is being developed by civil engineering students Kate Guravich-Thompson, Rachel Hogge, Nic McCarthy, Greg Moran and Dawson Warman. The student group, working alongside mentors from the New Brunswick Department of Transportation and Infrastructure (NBDTI), has determined that the bridge, located on Maple Avenue and close to a number of businesses including the Sussex Post Office and fire department, needs to be completely replaced. In recent years, the bridge’s load capacity has been reduced from a 43.5-ton capacity to 22 tons. As a result of this weight restriction, transport trucks that may have once used the bridge as a throughway are now required to take a detour nearly 3km in length. “The bridge serves a main road in Sussex, but because of deterioration to the piers and abutments and various cracks throughout the structure, it has a reduced load capacity,” says Mr. Moran. While the bridge is inspected every year by NBDTI, flooding and subsequent ice build-up continues to diminish the bridge’s service life. At 82-metres long, the group’s plan includes reducing the length of the bridge to 48 metres. Their reinforced concrete design includes bike lanes on either side of the bridge, a raised sidewalk for pedestrians, and widened lanes for vehicles. While NBDTI will not implement the student group’s design directly, it may take possible cues from their plan. 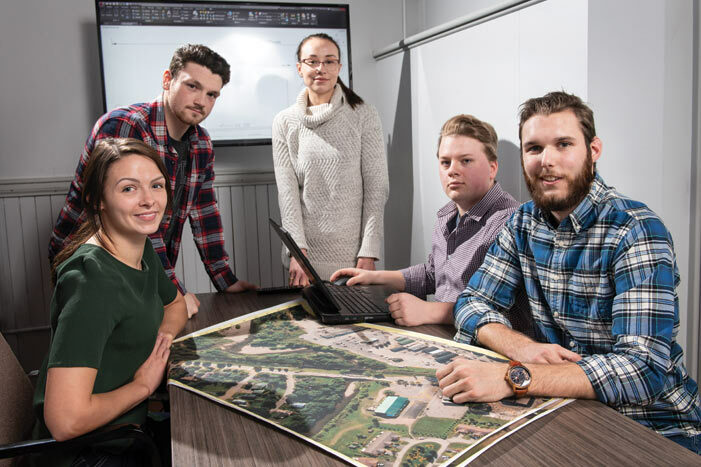 The student group will present their plan at UNB’s annual Engineering Design Symposium on April 4, 2019, at the Fredericton Convention Centre. Admission is free and all are welcome to attend.